Pauly Baldacchino sent these photos and text, from the event held in late 2000 at Geelong, a coastal town in Victoria, Australia, about 70 miles west of Melbourne. 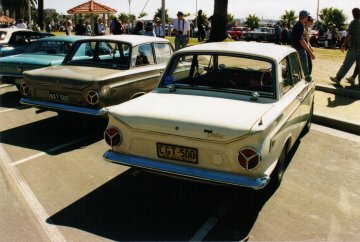 Geelong is the home of Ford Australia, and there were over 4000 Fords attending, an amazing day. 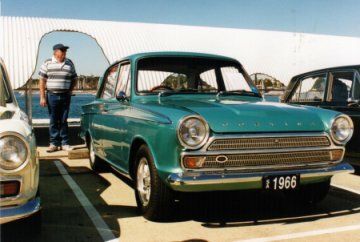 The Cortina Mark One Owners Club (CMOOC) Australia (Pauly is the newsletter Editor) has been around since the early 90's and has around 100 members world-wide. 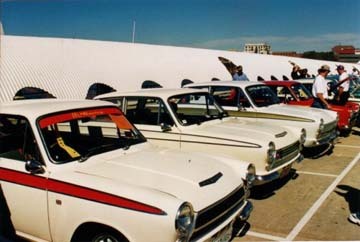 They do not have a website but some club info is on Andrew Hardie's Cortina Site. "From front: 64 2dr GT semi race car, big hp 1500 C/R box etc, another 64 2dr GT, 1700 kent engine, 65 GT 500 basically standard, 64 Airflow LoCort race car in Alan Mann colors. All Cars from Victoria." "2 GT500 Bathurst Specials from New South Wales. 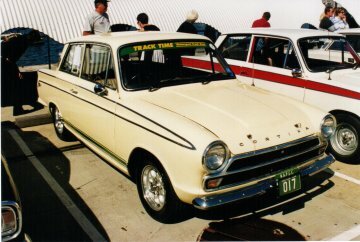 both basically original 1500 powered cars, built as race specials for OZ with twin fuel tanks, carpet delete (rubber floor matt instead), early LoCort 2.5:1 1st gearbox, different cam and other engine mods. 112 built in 1965, there were at least 8 of them at the 75th aniversary, a record gathering for these now rare cars." "Another GT500, I think from NSW or Queensland." "A lovely dark green 66 GT 4dr, with Lotus twin Cam engine fitted by owner. 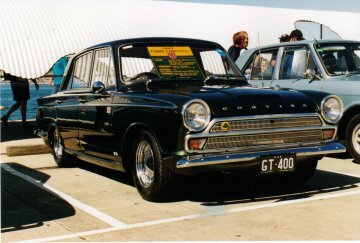 We have very few 2dr GT's built in OZ, 95% approx 4drs." "65/66 4dr GT Pushrod engine, factory color similar to your US Fords 'Tahoma Turquoise'. Car from South Australia."